Wow, that Horde leather set makes me want to switch factions more than anything I’ve ever seen. Vulpera when? Other than the absurd giant plate belt, these sets look pretty good. I like all the raid sets except the mail one. like.. it’s just…. lacking. Same with the horde plate pvp set. they rest are all decent to awesome. Has Blizzard given up with putting effort into things? These sets look pathetic. I do too, a bit. But I don’t really mind taking a break from class sets if it means getting new racial sets for Horde and Alliance with every Warfront. Hoping to see some Tauren-theme stuff for my Shaman. Hopefully something watery too since after 10+ years of Ice, fire, blue fire, extra lightning omega fire… And fiery rocks. Yeah. It needs some more detail on the helm and the chest, and those particle effects seem to be missing. did they change the mail set and leather set a bit for the raid gear? Really loving those pvp sets for both sides, but the darkness within me embraces the horde sets the most. The Warfront sets are nice, but man… I really miss class tier sets. So i want to play a game. Can you spot the differences from the first iteration from this iteration of the Dazlarzar raid sets? 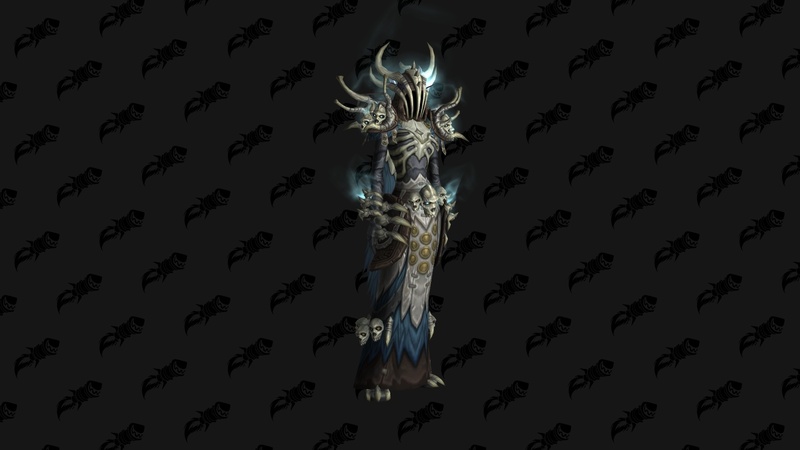 Cloth: belt changed to 3 skulls, boots changed to skeletons on feet, and bracers have more skelton and glowy part. Leather: belt changed to skeletons coming down in front like a loin cloth, gloves more skeletons bones and glow coming off it, boots change from skeleton feet to skeleton boots. Plat:Less horns on the hip, no horned knee pads. Come on do more with the mail set! A MAIL ROBE? IN BFA? POGGERS!